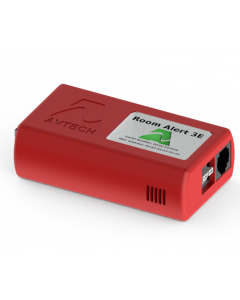 The AVTECH Room Alert monitors are highly functional environment monitors with great value for your money. They have the features you'll love and are also absolutely rock solid. From the most economical of the range, the Room Alert 3 Wi-Fi, all the way through to the powerful Room Alert 32W, we think you'll love the convenience and value. Each Room Alert model has an embedded web server. The web server enables you to carry out configuration and monitoring duties all from your web browser. Managing multiple monitors from the web server can be a repetitive, tedious and error prone. Fortunately, AVTECH have developed three approaches to ease the burden of managing a large estate of monitors. Simple Network Management Protocol - all Ethernet based units support the SNMP protocol. SNMP has been a network management staple for many years and enables integration with your existing network monitoring tools. Your Room Alert estate becomes just one part in your existing monitoring system so you can leverage your system's existing alerting capabilities. If you wish to monitor something, you have to measure it. Measuring is where sensors come into the picture. Sensors allow your Room Alert monitor to measure various environmental factors like temperature, humidity, power, wetness and air flow among many others. AVTECH have three different types of sensors. Not all Room Alert monitors have the same or all types of sensor connectors. The Sensor Compatibility Summary table below outlines which sensor is compatible with which Room Alert model. The Room Alert range of monitors are fitted with built-in sensors. The built-in sensors available in each Room Alert monitor are outlined in the Room Alert Comparison table under the Built-in Sensors section. Digital sensors are by far the most popular type of sensors. 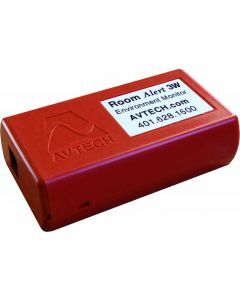 Digital sensors are also supported by all Room Alert models. Digital sensors provide a reading over a given range. For instance, the standard temperature sensor provides a temperature reading within a measurement range of -55 to 125°C with an accuracy of ± 0.125. The Room Alert can be configured to alert when the value read from the sensor goes above or below a threshold you configure. A switch sensor detects one of two states. Either the sensor is in a normal state or an alarm state. A switch sensor does not provide measurements to the Room Alert in the same way as a digital sensor. It is either in a normal state indicating that whatever the sensor is measuring is not in an alert state, or it is in an alert state. The alert state depends upon what the sensor is designed to monitor. In the case of the wetness sensor, the sensor will enter an alert state when the sensor detects flood. In the case of the smoke sensor, the sensor will enter an alert state when a level of smoke is detected that indicates that a fire has started in the vicinity of the sensor. An analog sensor provides values as voltages between 0-5VDC. Common analog sensors include current loops and extreme high and low temperature sensors. Not all Room Alert models support analog sensors. Those that do not support analog sensors can still utilise them through the use of the Digital Temperature & Analog connector adapter. A table illustrating Room Alert monitor support for each external sensor. Not all Room Alerts have the same sensor ports. You can attach analog sensors like the extreme high and extreme low temperature sensors by using the Temperature & Analog sensor connector attached to a digital port. 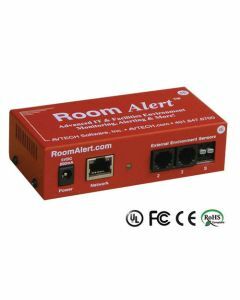 Each Room Alert monitor includes a 12 month Personal subscription to RoomAlert.com. You can upgrade your subscription at any time to a higher subscription level. If after your twelve months subscription you do not renew, then your subscription reverts to the Lite level. The Lite subscription gives you limited access to the cloud service but does not give you access to the Downloads area nor personal technical support. You do not need to use the cloud based service. Your RoomAlert.com subscription is the gateway to all support services including access to firmware updates, software, plugins and different levels of technical support as well as cloud monitoring of different capacities.